Beckman‘s Group 1 fired the Cr(NO3)3, Cd(NO3)2, plate from last week and treated a plate with UV to prepare for next week’s endeavors. Group 2 made a solution of 0.03M of bismuth nitrate, spotted their plates and plan to let it dry over the weekend and fire it before next Friday’s meeting for testing. Group 3 spotted a UV treated plate with 0.1M of Fe(NO3)3 and Al(NO3)2 using three different ratios of 2:1, 1:2, and 1:1. They are planning to fire the FTO plate and test it next week. Group 4 has been continuing to test the effects of varying length of exposure to UV treatment on the FTO plates. Today, they etched a new, clean FTO plate and UV treated it for exactly five minutes. This plate that was treated for five minutes was spotted with 0.03M Fe(NO3)3 solution to be fired in the oven. They also did the same for another plate etched with UV for sixty minutes. 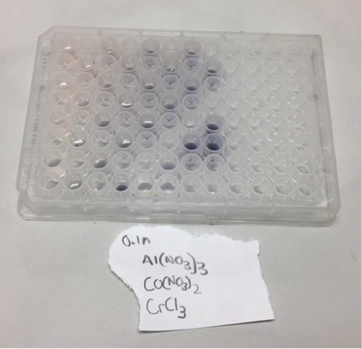 Canyon Crest was able to create 5 more well plates of materials this week including Al:Co:Cr which is pictured below and has an interesting greyscale arising from the Chromium solution in different concentrations in the other, transparent, solutions. They also made a very interesting experimental plate consisting of 0.0005M NH4VO3; 0.1M Fe(NO3)3; 0.1M K2Cr2O7. They were able to create some nice looking color gradients (that are also easier to spot on the well plate when arranging the concentrations). *Helpful tip from Canyon Crest: find the solubility of a solution before you prepare it- either from the bottle or a website like PubChem. They had a failed attempt at making BiNO3 solution trying to dissolve in Nitric Acid, Acetone, and Glycol while on a stirring hotplate – as the bottle instructed. However, the bismuth always precipitated down to the bottom of the beaker and individual particles were easily seen. San Marino Blank Team tested their last plate made in 2017. Flaking after baking is evident. Applied voltage of 0.05V and had dark current around 0.3V, but the results were all in the dark blue range. Reason why there are not so good results is because severe flaking during baking (temperature exceeded 500 degrees as evidenced by silvery powder within iron rings). This is true especially for Cu spots, which are very faint, probably not enough to make the “incident” from last week happen again. Next time they plan to spot a new plate using iron/copper controls. Iron is the “primary” control, copper control exists to see if they can reproduce the “incident” from last week. Main focus for this new plate is Ni and Cu: 100% Ni; 75% Ni, 25% Cu; 50% Ni, 50% Cu; 25% Ni, 75% Cu; 90% Ni, 10% Cu.